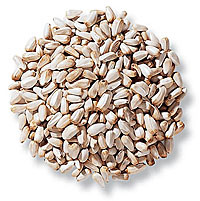 Safflower Oil is, as the name implies, an oil made from the extract of the safflower seeds. Safflowers; both as a plant and after being pressed into an oil have had a rich history in civilizations in both the east and the west and it’s still very much viable in today’s economy and diet. Safflower oil is one item that bridges the commercialization of agriculture from ancient times to modern day. There are a number of benefits to using safflower oil as a health and nutritional supplement, but it also has a variety of commercial purposes as well. The safflower plant (Carthamus Tinctorius) is an annual that is related to the sunflower. It resembles a thistle in that they develop petals in a yellow/orange color which eventually drop, exposing the safflower seeds. The seeds are then removed and either left as they are or treated. Both are then dried and then sent to various processing plants for pressing and distribution. The untreated seeds have a bitter taste and a somewhat dry quality so they are pressed into oil and then used as an oil in commercial production of products like soap and linoleum floor tile. The treated seeds are pressed into oil where they are then classified into two types that are both used in cooking; monounsaturated and polyunsaturated oil. The monounsaturated safflower oil is commonly used as cooking oil that is suitable for high temperatures; such as use in a deep fryer. The monounsaturated oil is shelf-stable and can be stored in a cool, dark, and dry place. The monounsaturated oils are often advertised for their durability in cooking at high temperatures. 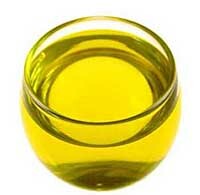 The polyunsaturated safflower oil is high in linoleic acid and is used as cold oil such as mixed into salad dressings. The polyunsaturated oil is not shelf stable and must be kept in the refrigerator or in a cool location. Polyunsaturated safflower oils cannot be used in cooking as they will become rancid. Many bottles will specify what type of safflower oil it contains so there is no confusion. There are often questions about the differences in other healthy oils such as olive, sunflower, canola, or vegetable oil. Safflower oil tends to carry far more Vitamin E that olive oil, but according to Nutrition.gov; olive oil is higher in Vitamin K. Safflower and Sunflower oil have a significant amount in common such as they are both higher in essential fatty acids Omega-3 and Omega 6 than any other oils. Sunflower oil contains more Vitamin E than Safflower oil, or any other oil and it is sometimes preferred for that reason. Safflower oil and canola oil have a lot of the same great heart-disease fighting nutrients like monounsaturated fats and Omega-3 fatty acids. One main trade off of replacing safflower oil with canola is that you cannot cook at as high of a heat. The smoke point of canola oil is 460 degrees while safflower oil’s smoke point is 509 degrees. Canola oil is also much less expensive and is often substituted for safflower to reduce cost. Safflower oil and vegetable oil have a lot of the same properties in that they can be heated to a high temperature, are virtually taste-less and are heart-healthy. They are often substituted for one another in recipes. Although there is no consensus among doctors and tests are on-going, safflower oil has been shown to alleviate the symptoms of coronary heart disease, Type 2 Diabetes, high blood pressure and arteriosclerosis. Although none of these claims have been proven, many people have shown that there are significant benefits to using safflower oil for health benefits. Safflower oil also contains a high amount of Vitamin E which reduces respiratory problems, helps blood circulation, and strengthens the immune system. The high concentration of Vitamin E also helps the body eliminate free radicals in the body, lowering the risk of heart disease and cancer. It is great for cooking as the nutritional value is not lost even when heated to a high temperature-such as deep frying. Safflower oil is high in unsaturated fats and low in saturated fats making it a great choice to keep your heart healthy. It also contains Omega-6 fatty acids which help the body burn fat. These fatty acids also build prostaglandins which help control muscle contractions, balance blood pressure, and help the immune system. Other oils that contain omega-6 fatty acids: macadamia oil, flaxseed oil. The oil is also added to a number of bath and body products as it helps smooth and moisturize skin. When applied directly to the skin, it can also reduce the visibility of lines and wrinkles, reduce eczema, and reduce inflammation and redness. Either type of safflower oil; monounsaturated or polyunsaturated, can be used for food purposes and are shown to contain less saturated fat when compared to other cooking oils. Safflower Oil also does not contain any cholesterol which makes it part of a healthy diet. Safflower Oil has a number of uses both in personal and commercial applications. Although the safflower is now primarily grown for its oil production, it was originally grown for a number of uses; the flowers were originally used in yellow and red dyes for both food and clothing. In addition to the oil production, safflower oil is also used as a cooking oil. Although it is more expensive than other options, it handles higher temperatures than other common cooking oils. 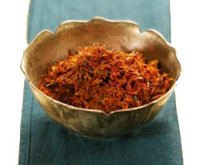 The petals of the Safflower plant can be used in cooking as a substitute for saffron. It provides much of the same flavor and color as the more expensive saffron and has become a popular additive in its own right. The petals can be soaked in water to create a tea which is consumable by itself or made into an extract to be used in cooking. The oil can be used directly on the skin for its moisturizing benefits. Safflower oil can be used in cooking both for deep frying and for salad dressing and marinades. Safflower oil can be used as a nutritional supplement, but it’s most common use is for cooking. The petals of the safflower plant as well and the safflower oil that is produced from pressing have common uses in food preparation. Safflower oil can be used in commercial production as a drying oil used in printing. The remaining mash is used as part of grain sold to put into livestock feeds. The oil can be used to promote healthy hair and nail growth my massaging it into the scalp and nail bed. It is also used in massage oils and lotions as it is low in comodegenic action and doesn’t clog pores. It is also used in Chinese medicine to invigorate blood and reduce pain. Studies have shown that a daily dose of 1 ¾ tablespoons of safflower oil have improved a number of health issues including cardiovascular health, it reduced abdominal fat and increased muscle tissue after 16 weeks of a daily dosage. It was also shown to improve good cholesterol (HDL), blood sugar, inflammation, and insulin sensitivity in obese post-menopausal women with Type 2 Diabetes. The side effects of safflower oil vary between different experiments, but some side effects are known to occur. Because safflowers are in the daisy family, some people who were allergic to daises experienced an allergic reaction. For patients using safflower oil every day; diarrhea, vomiting, and stomach cramps were reported. An unpleasant taste and nausea were also reported by those taking safflower oil as a daily supplement. If you have a heart condition or low blood pressure, you should consult your doctor before starting any safflower oil treatment as it can lead to a drop in blood pressure. Safflower oil is not recommended for use during pregnancy as it may induce contractions and labor. Always speak to your doctor about potential benefits and risks before starting any treatments. Note: This information is for consumer interest and education only. It is not meant to be a substitute for the assessment or diagnosis of a physician or to encourage random use. It is strongly recommended that you seek the advice of your doctor or holistic health professional before beginning any prescribed treatment. The safflower oil should be kept in a dark, airtight container and it should be stored in the refrigerator. It is important that the less light and air that reaches the oil the better to reduce the chance of oxidation. Only buy the quantity that you will use within a couple of months as this will keep the oil the freshest. I just discovered Safflower oil and it has been a “life saver” for me. I started using Canola oil when it first came out and noticed a change in my digestive system. I finally switched to corn oil a couple of years ago. From the moment I switched to corn oil, I began to have even more problems with my upper GI. I attributed all of this to stress never thinking that cooking oil could cause such problems. After two hospitalizations with a closed colon, vomiting, and all the other unpleasant things that go along with diverticulitis, I started doing some research about cooking oils. I switched to safflower oil and in twenty – four hours my digestive tract was calm and relaxed. I had reached the point that water and white foods were all that I could eat or drink. In just a few short days I am eating fresh ripe tomatoes, vegetables, fruits and enjoying life again. I never realized that cooking oil could play such a vital role in our overall health. I just wish that more people were aware of the benefits of Safflower oil. It is truly amazing how my health has improved in just a week or so. History, Types, Uses, Nutritional Value, Dosage and Side Effects” was great. I’m generating out a replica to show my buddys. I’m looking for the weight of safflower oil per ounce but cannot find the info. Help please. Copyright © 2011-2019. Safflower Oil. All Rights Reserved.